Coming into the World Cup, the big advantage Brazil had over supposed heavy favorites Germany (ha!) and Spain was the presence of a real-deal superstar. In an international tournament, where collective attacking intricacy is in short supply, an individual’s ability to take the ball from one side of the pitch all the way to the other and stick it into the back of the net by himself is probably the single most valuable asset a team can have. And since superstardom is more or less defined by that ability, having a star when an opponent doesn’t can make all the difference in the world. Sure enough, Brazil have benefitted from one of their players’ star-making performances in their successful if at times shaky group stage showing—only it hasn’t been the star we all assumed it would be. It was supposed to be Neymar who would lead the way. Neymar is the second-best player in the world, in the absolute prime of his career, and is surrounded by a supporting cast with Brazil that’s just about the Platonic ideal of what a great national team should look like. Everything was set up for Brazil to make their push for the World Cup trophy, and for Neymar to be the one leading the charge. What too many failed to account for just how long it would take Neymar to be himself again after his injury early in the year. There was never much doubt whether Neymar would be healthy for the biggest tournament of his life, and him sitting out the back half of Paris Saint-Germain’s season after breaking his foot in February allowed him plenty of time to heal completely. But recovering health is one thing; recovering form is another all together. Taking some four months off from competitive play has taken its toll on Neymar’s game. While he’s still been good and often dangerous so far this World Cup, he still appears to shaking off the rust. He’s not quite as explosive as he is at peak fitness; too often he’s slowed down Brazil’s attacks by always asking for the ball at a standstill and taking too many touches before doing something with it, and both his passing and shooting haven’t been quite as sharp as usual. Add that all up and you get a Neymar who is an important cog in Brazil’s attack, but not the kind of transcendent, tone-setting player he is in his pomp. Luckily for Brazil, Philippe Coutinho has stepped up. 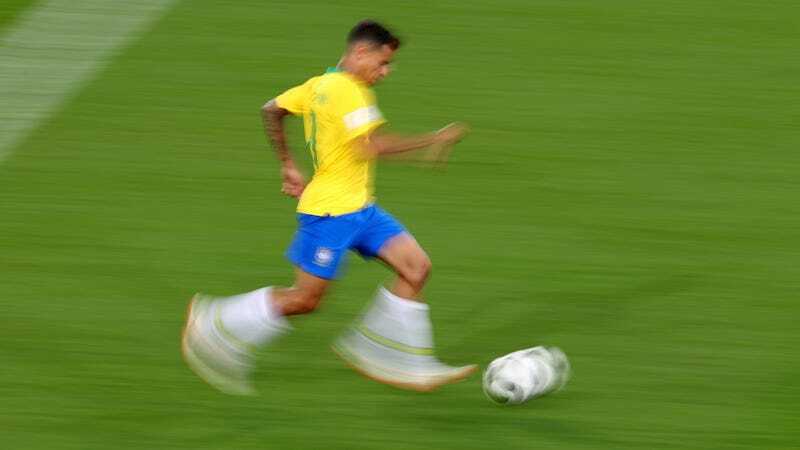 Coutinho has been Brazil’s best player at this World Cup, and you can make a case that he’s been the best player in the whole tournament. His presence is felt in everything Brazil do with the ball. Of the Seleção’s five group stage goals, Coutinho has scored two and assisted one. Each one of his direct interventions on the scoreboard came at a crucial moment, too. His trademark deep banger of a goal against Switzerland put Brazil ahead in that match; his go-ahead stoppage time toe-basher against Costa Rica was what sealed three critical points; and his gorgeous lofted through ball that Paulinho flicked into the Serbian net broke the deadlock in that game as well. When Brazil have been in search of the goals that matter most, Coutinho has been the one conjuring them. Coutinho’s influence hasn’t been limited to the scoresheet, either. So far this tournament he has taken the second-most shots on the team, created the second-most chances for his teammates to shoot, made more total passes than any other Brazilian, and of Seleção players that have started at least two games, Coutinho’s passing completion percentage is behind only the two center backs. Coutinho is on the ball all the time and is doing everything with it, all with impressive efficiency. He’s putting up the stats of a great forward from the central midfield position while also excelling at the traditional midfielder tasks. Coutinho is two great players in one, and it’s multifaceted greatness like that that wins World Cups. This is what makes Brazil the team beat this summer. They have one of the best players ever to emerge from the best soccer nation in the world in his prime, and right behind them they have another world-beater ready to take over when necessary. Coutinho, more than any other single player, is the reason why Brazil are in the comfortable and commanding position they currently find themselves, and there’s no reason to think he can’t keep it up for as long as Brazil are still in it. Not only that, but Neymar too is only looking better and better as the tournament continues. If Coutinho keeps up his game and Neymar gets back to his usual self, Brazil will have two superstars firing on all cylinders ready to crush all comers. There’s not a team in the world that wants to face a juggernaut like that.